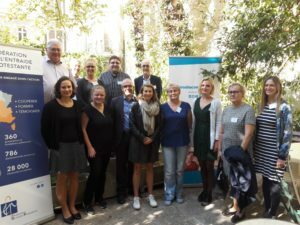 We have recently released the event report of our annual meeting of the Social and Health Care Services Network, hosted last month in Paris by our French member Fédération de l’Entraide Protestante. During our two-day network meeting, 15 representatives from our membership gathered to discuss the provision of long-term care services. During the first day, participants had the opportunity to discover the French context and the situation of long-term care with a focus on residential care for older people, and to visit the Diaconesses de Reuilly Care Home in Paris. The following day, the participants discovered the ProACT pilot project, aimed at providing a digital support in self-management of people with multiple-chronical diseases in an integrated care framework. During a session dedicated to members’ project presentations, the participants had also the chance to learn more about long-term care projects run by Eurodiaconia members in Finland, the Czech Republic, Ukraine and Serbia, related to working areas such as home care and home services for older people, support services for informal carers and long-term care for persons with disabilities. The meeting was concluded by a policy workshop on the long-term care principle in the European Pillar of Social Rights during which the participants provided interesting inputs on how such a right should be brought forward at the implementation stage. To know more about the Social and Health Care Services Network Meeting, please read the event report.